The Penclic Mouse R2 on paper is the offspring of an indecent liaison between a mouse and a stylus. The base of the device which sits on the desk is, in effect, a micro laser mouse. Sprouting from the centre of this base plate, attached to a ball and socket joint, is a stylus like appendage. Whilst the description of this device alone may sound rather Frankenstein’s Monster, in reality, the design is rather elegant and the proportions such that it reminds me of a pen sat in an ink-well. As far as ancillary function goes, on the baseplate there is a scroll wheel and the stylus contains the various click action buttons. The Penclic Mouse R2 is delivered in attractive tube like packaging, containing the Penclic device, brief user manuals, an extensible micro-usb connector and a storage pouch. The biggest question in my mind ahead of being asked to review this device was whether this was going to feel like I was using a strange mouse, or whether it was going to be more like a stylus. I’ve used a Wacom tablet and stylus combination in the past and there are some really nice natural aspects to using a pen as an input device. However, a pressure tablet takes over a large portion of your desk space and switching back and forth to a keyboard is often then a difficult task. 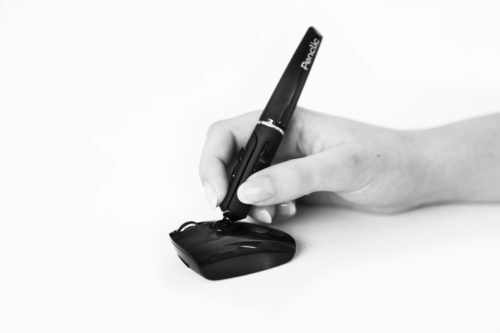 The Penclic, if stylus like, could therefore offer the advantages of a stylus with the convenience of not having a tablet cluttering up your desk. I can report that it goes some way towards this. Certainly, you have the natural feel of a pen in the hand when moving around the page. However, it can’t replicate the accuracy of a stylus down at the pixel level. 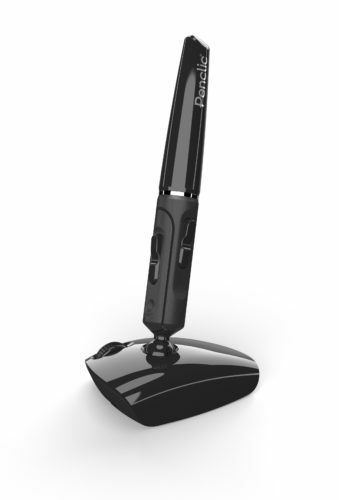 If you are looking at this device and wondering whether it offers a great hybrid tool for freehand drawing, then the fundamental mouse like device translating the movement of your hand just can’t deliver on this. That’s not to say that the action is not precise and accurate in use on the desktop. But in operation, this is very much a mouse with a novel, and natural, way of holding it. To be fair, the device isn’t sold as a stylus/tablet replacement, but instead as a device that avoids Repetitive Strain Injury (RSI) which can result from using an ill designed mouse. On this front, it’s impossible to verify that claim within the scope of this review. The device feels natural to hold for mouse movement and left clicking. However, it’s awkward when stray to the other buttons on the pen. Even more so when you want to use the scroll wheel on the base unit. One further niggle was the sloped front to the base unit, where the micro-usb charge point is located. Because of the angle, it’s not possible to use a standard micro-usb cable as in order to make a connection, the metal connector needs to be elongated. A slightly lessened angle would have prevented this being a problem and seems rather short-sighted design decision. In day to day operation, I found that in an environment where use of the mouse and left click is prevalent, the Penclic excelled. It felt comfortable, accurate and natural. Where it falls down for me is where you need to keep switching backwards and forwards from the keyboard to the mouse and in situations where you want to use the scroll wheel extensively. Under those use cases, I found simply that I was slower and less efficient than when using my traditional mouse. The Penclic Mouse R2 is a nicely presented device and feels solid and well made. It has some design niggles that make it slightly less efficient to use than a mouse for day to day desktop application but if you suffer from RSI by using a traditional mouse and would find the action of holding a pen more comfortable, then this could be the device you’ve been waiting for. Join Chris and Ian as they discuss the Sony Hack, Europe wanting to split Google and the highlights from the Playstation Expo. There’s even a pick.